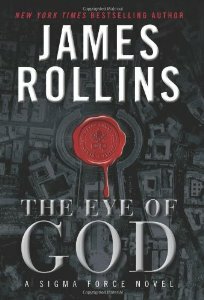 In THE EYE OF GOD, James Rollins demonstrates his singular talent at constructing nail biting thrill rides out of ancient history and cutting-edge science. Once again, Sigma Force burns up the pages, racing across the globe on a quest to prevent the total destruction of the planet. When a U.S. military satellite carrying a dark energy physics project passes through the tail of a comet, space-time around the earth ripples. The satellite falls from orbit, transmitting its final image—the sight of a smoldering Eastern Seaboard, decimated by a rain of asteroids—less than four days in the future. At the same time, a mysterious package arrives at the Vatican containing the skull of Genghis Khan and an age-old tome bound in his skin—clues to an ancient weapon that could save humanity. Sigma Force must make a marathon dash against time through North Korea to the outer reaches of Mongolia to uncover the hidden tomb of Genghis Khan in a desperate bid to prevent the ensuing apocalypse. Rollins takes the most seemingly unrelated science and history and creates such a logical connection between them that it makes one wonder why no one saw it before. Add to this his strong female characters, intelligent story lines, and brilliant writing that convinces the reader that the world really could end in only four days, and THE EYE OF GOD is a complex mosaic of action that both thrills and satisfies. Sounds like a great one! Do the same cast of characters appear in this book too? Don’t read spy/thriller lit. There’s enough real stuff going on to occupy me: North Korea, the Middle East, Israel saber rattling, the Soviets dealing with an internal crisis that could spread beyond the Eurasian sphere. What’s a few asteroids? What? And miss the fun?